When the issue on the e-books pricing of those who will be in the iPad’s iBookstore started spreading, many are saying that it will be to Amazon’s advantage. Â The Kindle Store’s average price for an e-book is pegged at $9.99 and Amazon is even sacrificing some sales just to maintain this pricing even at a loss for them. Analysts are saying that the iBookstore will not be able to compete against this pricing and that e-books to be sold will be priced higher than the e-books sold in the Kindle Store. That may not be necessarily true at all. Â The blog AppAdvice got hold of a preview that shows otherwise. 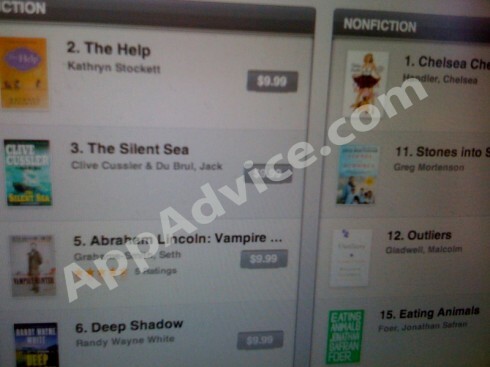 It seems that most e-books that will be sold in the iBookstore Â are also priced at $9.99. In fact, out of the 32 e-books that were on the New York Time’s Bestsellers, 27 titles have $9.99 price tag. 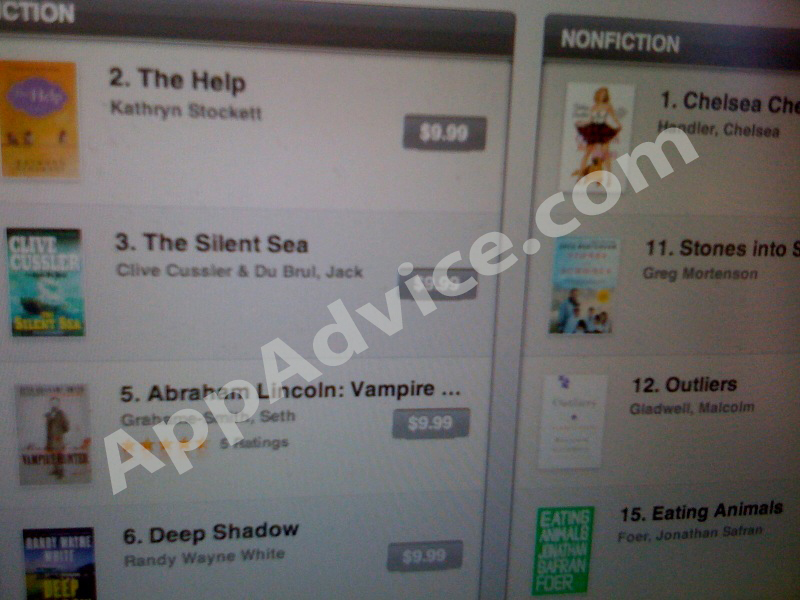 In fact 4 of Â the top 5 bestsellers will be sold in the iBookstore for $9.99. If the iBookstore will be able maintain this price ceilings for most of the books that will be made available once the iPad is launched, Amazon is definitely facing a stiff challenge to their well established and widely accepted e-book business. Â Indeed Amazon has all the reason to be worried and should start working on various enhancements to the Kindle store as well possibly on the Kindle device as well. Â But except for the lack of color display and other computing functionalities, I think Amazon may have already exhausted all possible features that it could probably include in the Kindle. So, will you be buying the iPad and use it as an e-book reader and purchase your e-books from the iBookstore? Or will you use the Kindle App for Tablets which will also run in the iPad and purchase your e-books from the Amazon Kindle Store still?